On February 9, 2019 during our annual open house, staff and students are present for questions and presentations. The studio spaces will be open, and it is also possible to visit the workshop facilities located at the Willem de Kooning Academy. For the masters Education in Arts, Interior Architecture: Research + Design, Lens-Based Media and Experimental Publishing please visit the location Wijnhaven 61, 4th floor, from 10.00 till 15.00. For the master Fine Art please visit the location Karel Doormanhof 45, from 10.00 till 19.00. We strongly advice you to visit us during our open days. If you are not able to come during one of our open days it is possible to make an appointment for an individual visit. Please note we cannot guarantee it is always possible, due to limited time. Each department sends regular email announcements for its public events. 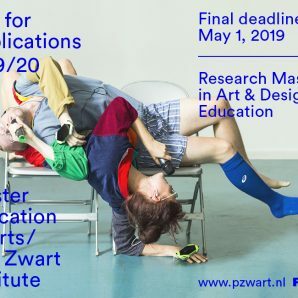 If you would like to be on this mailing list, please send an email to our mailinglist and refer to the Piet Zwart Institute public programme.